Astronauts aboard the International Space Station are gearing up for a pair of spacewalks on January 23 and 29 to complete the rejuvenation of the Station’s Canadarm2 robotic arm by replacing its second Latching End Effector to ensure the critical robotic asset remains in working order for capturing visiting vehicles, moving large external equipment and carrying spacewalkers during complex EVA scenarios. This latest spacewalk effort builds on work completed last October by Expedition 53 crew members Randy Bresnik, Mark Vande Hei and Joe Acaba who successfully changed Canadarm’s first grappling mechanism with a seldom-used spare and completed other maintenance tasks on the Station’s Mobile Servicing System. 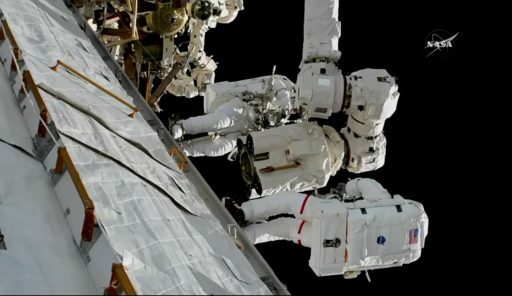 Both January EVAs will be led by Vande Hei, to be joined on the first excursion by NASA Astronaut Scott Tingle and on the second EVA by Japanese crew member Norishige Kanai, to accomplish the swap of Canadarm’s second grappling hand and then shuffle the two removed grappling mechanisms to return the one in worse condition to the ground for refurbishment while the still-functional unit will be installed on a temporary payload holding system. Pending final ISS Mission Management Team Approval, Tuesday’s EVA is expected to begin at 12:10 UTC with Mark Vande Hei serving as EV-1 in Extravehicular Mobility Unit #3003 with red stripes and Scott Tingle as EV-2 in EMU #3004. 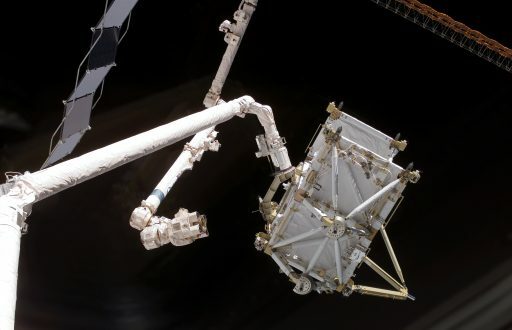 Designated U.S. EVA-47, the 6.5-hour excursion is expected to complete the replacement of the Canadarm2 Latching End Effector-B (LEE-B) with a brand new spare to give the arm two fully functional hands to continue working over the next decade. EVA-48 on January 29 will see Vande Hei reprise his role as EV-1 while first-time spacewalker Norishige Kanai ventures outside as EV-2, wearing EMU #3008. Their task will be retrieving the former LEE-A and taking it into the airlock while placing the former LEE-B on the Station’s external payload holding platform where it will continue to serve for the remainder of the Station’s life. Joe Acaba will be in charge of intravehicular duties for both EVAs and maneuver the robotic arm as needed for the complex replacement operation. 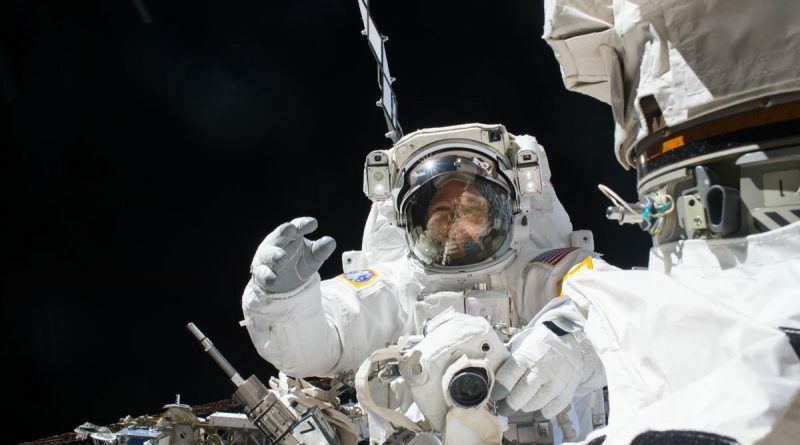 The current U.S. Government Shutdown does not affect the planned spacewalks and ISS Flight Operations which fall under the category of critical spaceflight operations and are not impacted by the funding lapse. What is impacted by the Shutdown is the non-operational aspect of bringing the EVA to the general public via NASA’s Public Affairs Office which typically is under furlough orders for a Shutdown. 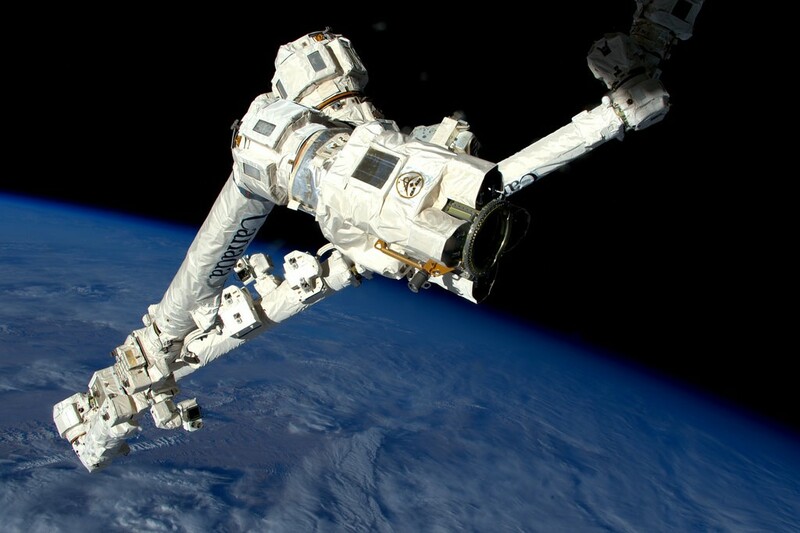 The 17.6-meter long Canadarm2 has become an indispensable tool for the International Space Station as it fulfills a large number of critical functions without which the Space Station could not operate as it does today. Some of the critical tasks handled by Canadarm2 include the capture and release of visiting Dragon, Cygnus and HTV cargo spacecraft, installing and handling external payloads and other components, assisting in spacewalks by moving equipment or astronauts, and working with the two-armed Dextre robot on complex external maintenance tasks that would otherwise necessitate a spacewalk. Now a central part of keeping ISS operating as a world-class science facility in Low Earth Orbit, there is great desire to keep Canadarm2 in working condition – taking advantage of its design as a maintainable robotics system that allows for modular change-out of its individual components, from small parts like cameras and lights to the complex joint and grapple mechanisms. As a larger and more advanced version of the original Canadarm flown on the Space Shuttle, Canadarm2 was delivered to the Station by the STS-100 mission in April 2000 and it played an instrumental role during assembly of the Space Station by moving modules and truss components into their installation locations. 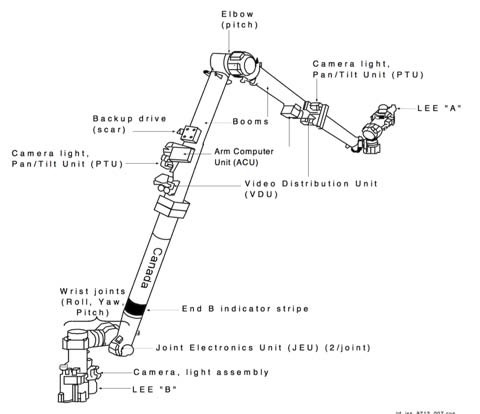 Canadarm2 has seven motorized joints: an elbow hinge in the middle and three rotary joints on the shoulder/wrist ends – allowing the arm to move in seven degrees of freedom much like the human arm, but with a much larger range of motion. The two Latching End Effectors (LEEs) on either end enable the arm to self-relocate between the different Power & Data Grapple Fixtures installed on the outside of ISS and the Mobile Base System allows the arm to traverse the entire length of the Station’s truss to reach its work sites. Canadarm2 weighs 1,800 Kilograms, is 35 centimeters in diameter and was designed to handle items of up to 116 metric tons, a capability chosen to allow the arm to assist with the docking of the Space Shuttle. 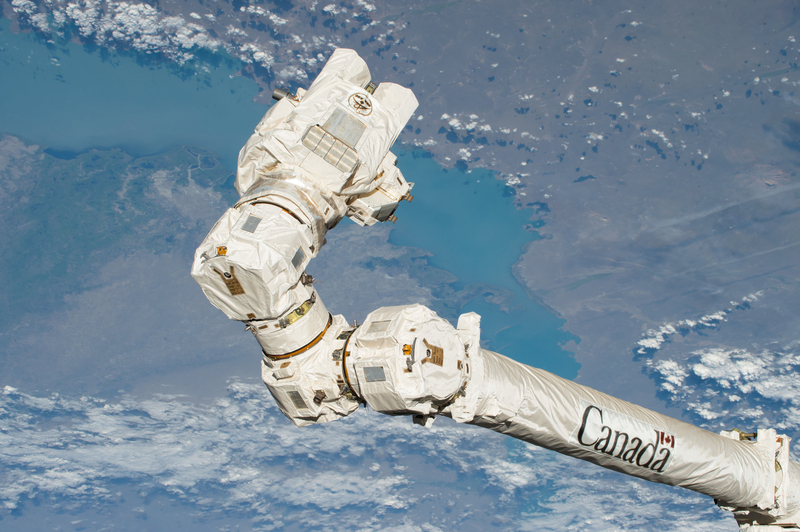 Canadarm2 grappled its first visiting vehicle in September 2009 when the first H-II Transfer Vehicle arrived at the Space Station, marking the first of 28 vehicle captures completed to date. Starting its tenure in the early days of ISS, Canadarm2 was controlled by crew members onboard the Destiny Laboratory via a wall of video screens and computer-generated visualizations. Most of the Station’s assembly tasks were handled this way including the installation of large pressurized modules and integrating the 108.5-meter truss structure as the Station’s backbone. In 2010, robotic operators finally received an out-the-window view of their work when a second robotics control station was established in the ISS Cupola, allowing for much-improved situational awareness via its panoramic windows. Over the years, the way robotics are performed in orbit changed dramatically as more and more operations shifted from crew control to remote control from the ground, allowing Canadarm2 and Dextre – a Station resident since 2008 – to complete complex maintenance tasks without taking up precious ISS crew time – a capability showcased in early 2017 when robotic work cut the number of EVAs for the replacement of a dozen batteries from six to only two. ISS robotics continue to improve to this day, highlighted by the recent ground-controlled release of the Dragon SpX-13 cargo spacecraft, an activity that had been handled by the onboard crew for all previous 27 vehicle releases. With over a decade of service under its belt, Canadarm2 not-unexpectedly began showing signs of degradation in the form of higher electrical currents when the Latching End Effectors were driving their moving parts – an indication that the electrical motors had to overcome greater friction within the LEE mechanics. In 2015, an effort began to prolong the life of the two LEEs by lubricating their moving parts – LEE-A (S/N 202) was lubricated by Astronaut Terry Virts in February 2015 and LEE-B (S/N 201) by Scott Kelly in October of that year. Given that both LEEs had outlived their planned 10-year design life, wear and tear was only expected to grow and an effort was started in 2017 to work toward replacement of the two LEEs in orderly fashion before one would fail for good. 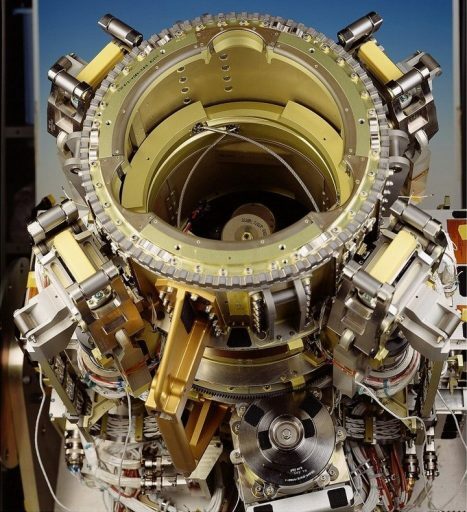 LEE-B was earmarked for replacement first since its degradation appeared more severe and preparations for the replacement EVAs started in July 2017. 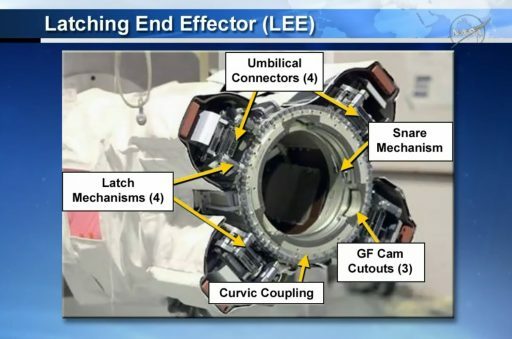 As luck would have it, Canadarm2 encountered a motor stall on LEE-A in August 2017 that left the arm without the capability of forming an electrical/data connection through the affected LEE – leaving it without walk-off capability. This prompted a change of plans as the LEE-A replacement now had priority over swapping out LEE-B which was punted into the early 2018 time frame. 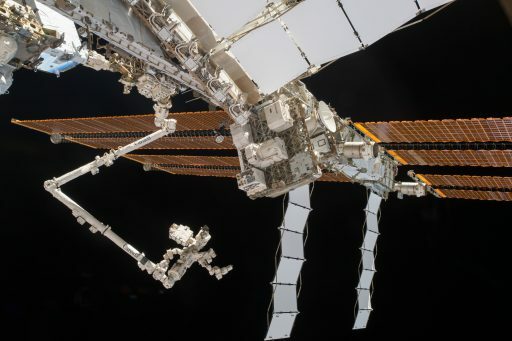 The LEEs of the robotic arm, Dextre robot and Mobile Base System – each weighing 200 Kilograms – are among the most complex electro-mechanical systems on the Space Station, hosting a large number of actuators, avionics, force-moment sensors and each has a camera to provide guidance for robotics controllers. Via a pair of EVAs in October, LEE-A was removed from the arm and replaced by LEE S/N 203 that had been on Station since 2002 and served as the POA LEE (Payload/Orbital Replacement Unit Accommodations). As part of its POA duties, LEE #203 was only actuated 14 times compared to over 400 cycles for LEE-A, allowing it to serve as a viable spare despite having been in orbit for over 15 years. The October 2017 EVAs wrapped up with lubricating the new LEE-A and leaving the degraded #202 LEE on the POA (taking it out of service). 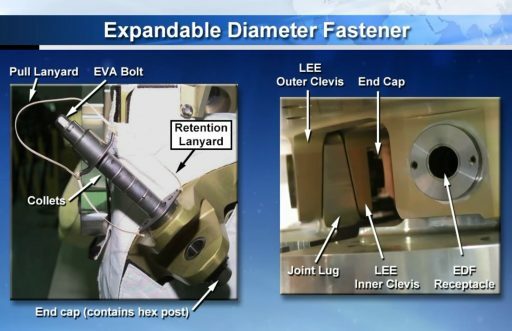 U.S. EVA-47 will have the single objective of removing LEE-B and replacing it with a brand new spare (S/N 204) that was delivered with Express Logistics Carrier 1 on the STS-129 mission in 2009 and has since been moved to External Stowage Platform 2 (ESP-2). 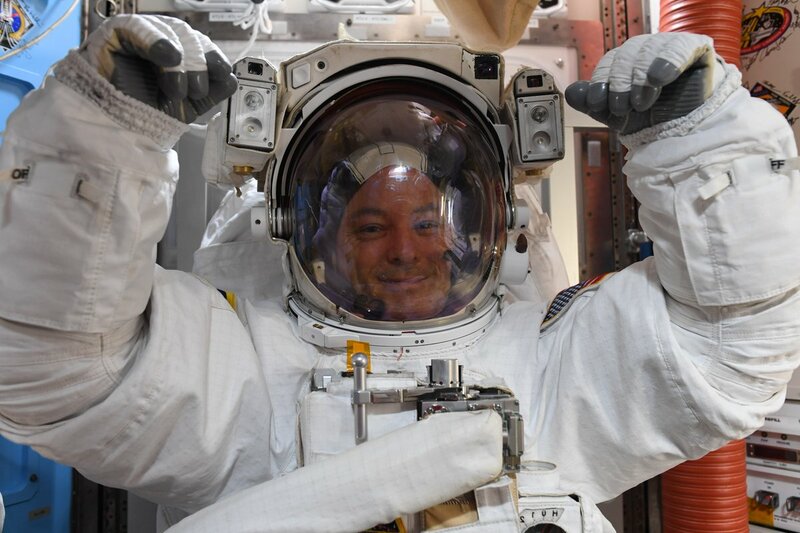 Per their spacewalk procedure, Vande Hei and Tingle will venture out the airlock with veteran spacewalker Vande Hei directly headed to the ESP-2 work site while Tingle will have a brief translation adaptation before fetching a foot restraint and meeting Vande Hei at ESP-2. There, they will remove Multilayer Insulation Blankets from the spare LEE, release four launch restraint clamps, pivot the LEE up in its restraint and uncover the joint interface where the LEE is held in place on its Flight Support Equipment (FSE). They will then release the first set of Expandable Diameter Fasteners (EDFs) holding the spare in place before ingressing their foot restraints to get started with work on Canadarm2. 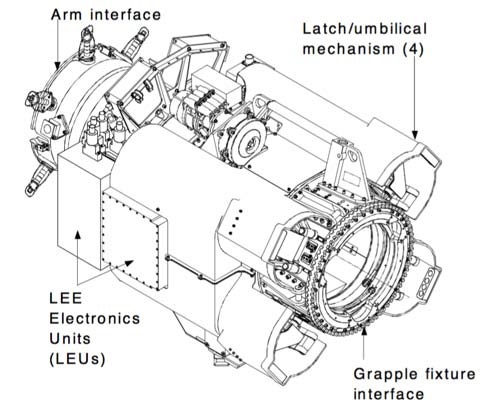 Six EDFs are part of the LEE-Joint Interface: They are fixed to the LEE and run through the LEE-joint coupling where they attach via a clevis-lug interface. Inside, the bolts click into an end cap with a hex post which enables the bolt to drive. When being driven via the Pistol Grip Tool, the length of the EDF decreases and collets within the interface are forced outward to create a friction fit with high rigidity and zero clearance. Previous experience exists on the EDFs and the spacewalkers and particularly the team on the ground is armed with several pages of ‘Cribsheet’ procedures to respond to fairly common problems like missing retaining lanyards, bolts failing to break torque, bolts not releasing from the lug/clevis even after the expected number of turns and bolts failing to install properly. 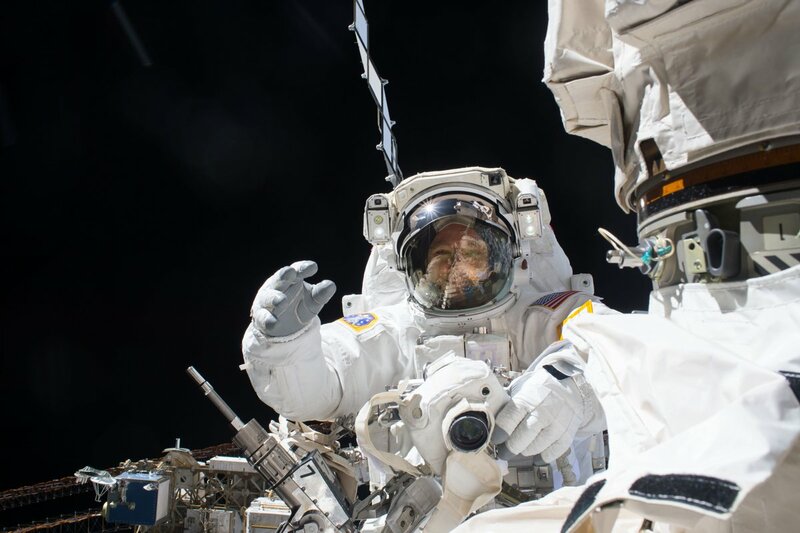 Joe Acaba, a robotics specialist with prior experience from Shuttle and ISS missions, will be in control of the arm – guiding LEE-B into position between the two spacewalkers so they can access the LEE-Joint interface for the removal of LEE-B. They will release the EDFs in pairs with the LEE being rotated between each pair for proper access. Before the last pair of EDFs is released, Acaba will power down the arm for the removal of the LEE. Vande Hei will take control of the LEE and move it into position for installation via four of six EDFs to a temp-stow ring that is part of the FSE hardware of the spare LEE on ESP-2. Their next task will be the removal of a Camera and Light Assembly (CLA) from the former LEE-B and installing it on the spare which is not equipped with a CLA – requiring two bolts to be driven via a pair of Micro-Devices on the CLA. With the spare LEE prepared for installation, the spacewalkers will release the last set of EDFs and Vande Hei will once again be tasked with holding onto the LEE and maneuvering it toward Canadarm2. Alignment guides will help the crew properly seat the new LEE followed by driving the first two EDFs to secure it sufficiently for the arm to be re-powered to allow LEE rotation for the other four EDFs to be driven. The astronauts will make at least two passes on each of the bolts since they have to be carefully torqued to specific values in order to ensure the bolts are expanded properly with zero tolerance in the high-load LEE-Joint interface. What follows for the crew is the cleanup of the ESP-2 worksite while Mission Control and ROBO controllers in Saint-Hubert, Canada work through a functional check of the new LEE and its various mechanical and electrical systems. If time permits, the crew can work from a list of get-ahead tasks but the primary EVA objective will be the LEE changeout. Available get-aheads include the lubrication of the newly installed LEE, a reconfiguration on the Dextre robot and there is a whole list of optional preparation tasks on various external spares to remove MLI covers and prepare these units for future installation efforts should any active components fail. If all goes as planned on Tuesday, Vande Hei and Kanai will get right to work where EVA-47 left off when embarking on their January 29 spacewalk. Their goal will be removing the current POA LEE (the former LEE-A, #202) and putting the former LEE-B (#201) in its place since it is considered well suited for the job as POA LEE which only sees a couple of actuations per year (its first use as POA LEE will likely come this summer when HTV-8 will deliver the next set of Li-Ion batteries). LEE #202 will be moved into the airlock at the end of EVA-48 to return aboard an upcoming SpaceX Dragon mission to undergo inspections and head into refurbishment to be available as ground spare. (Desired Config after EVA-48: LEE S/N 201: POA LEE, S/N 202: Inside ISS, S/N 203: LEE-A, S/N 204: LEE-B) The current ground spare will be flown as an external payload on the Dragon SpX-15 mission this summer to be staged outside the Station for installation on need should there be any problems with LEEs installed on Canadarm2 or Dextre.